The horror in the film Night of the Living Dead was a work of fiction, but in 1971 I lived through a night no less harrowing as a six-year-old with my widowed mother and two-year-old sister. Being trapped in our own house in remote Kalarabanka, an obscure village in the then Cuttack district, we were dying every moment while expecting a miraculous escape from the ordeal. Today when I look back, I shudder to think what could have happened to us in what could well be counted as the darkest night of our lives. The thought of that fateful night still runs a shiver down my spine. That night, hunger and poverty with all vengeance seemed to have joined the fury of nature to entrap us, but we overcame because of our strong will power to embrace life instead of succumbing to death. I still remember the ill-fated night of 1971 when a fierce storm accompanied by a heavy downpour washed away everything from our small thatched home. We were virtually held captive inside with nowhere to go. The dark night was waiting outside to entrap anyone daring to defy its dictate. 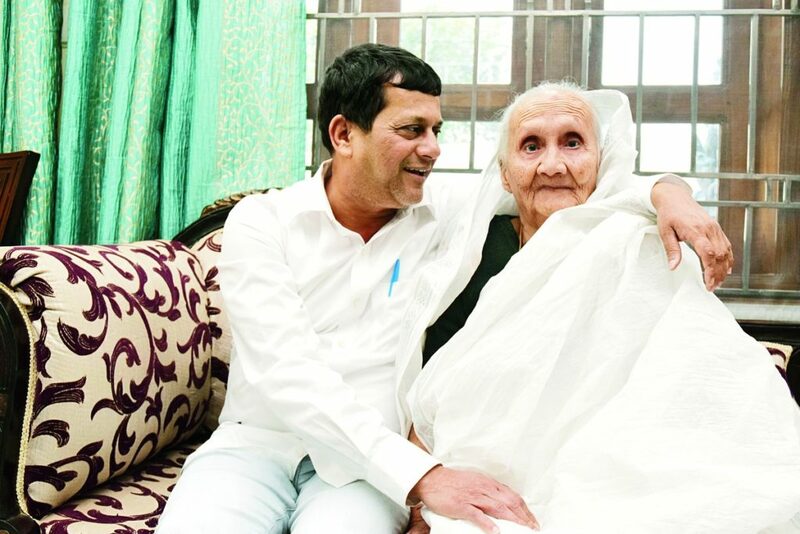 Bond of a lifetime: Achyuta Samanta with his mother. In that small space of the dilapidated two-room house, we all were perhaps waiting for an unforeseen future. The flickering ray of the light emanating from the half-lit broken lantern was perhaps our only ray of hope to survive. We all knew that the light will not be there for long as it did not have enough kerosene the night. Kerosene was also a luxury for us and we had no choice when it came to choose between darkness and light. That night was perhaps the darkest, as it had restricted our movements even inside the room. We could hear trees falling to the strong wind and it only added to our sense of fear. All we could do was to submit our fears to our fate. I can’t recollect any night worse than this, when it seemed that the fountains of the Great Deep had burst and the floodgates of heaven had split apart. But we neither had Noah’s Ark, nor the basket that saved Moses. All we could do was to cling to each other and pray that uprooted trees did not come crashing down on us. As water kept gushing through a hole in the thatched roof, we tried to keep ourselves dry but ended up getting drenched in the end. The cold wind blowing through whatever was left of our home made us shiver in the cold. It was indeed a night for the living dead. The pangs of hunger robbed us of our sleep, and with little to do our mother kept comforting us in every manner possible. I did not understand then that she was bleeding inside, trying courageously to control her tears. She tried to impress on us to wait for a while till she could get something to eat. All that she could find was some leftover wet rice and cooked wild spinach. But in that cold rain soaked night, serving us wet rice was out of question. She then asked us to wait till she made some pancakes with the flour she had bought a few days ago. I was no mood to eat that either, for I knew she would make it without any oil and I had to eat it without sugar. I was then too small to realise the pain I had unknowingly given her that day. One thing we knew was that our mother was not in a position to provide us with basic luxury. All my grumbling stopped when she found the oven and the fuel were filled with rainwater. Never to be cowed down, my mother searched for some puffed rice she had kept for me. She searched but could not find it as by then the lantern had run out of oil. My fear, my desperation and my helplessness got transformed into anger against my mother, who never allowed buying a matchbox as it was also beyond our affordability. Our next-door-neighbour always lighted our lamps, but that night it was out of question. Being virtual prisoners in my own house, I had no option but to sleep. Hunger, fear and the chill in the air even denied us of that. It was the best she could offer us. Before she could finish, there was a huge noise nearby caused by a falling tree. I cried out loud fearing that would crush was alive. In fear I started to crawl towards my mother in the dark. I just leapt over her, holding her tight to ward off the fear. Without a grain in the stomach and all things eerie happening around us, I started to chant Jagannath’s name. The greater my pang of hunger, the louder grew my chant. The night slowly gave way to a new dawn and the inclement weather began to ease. We mustered courage to step out and witness the trail of devastation the gale and heavy rain had caused. It was still raining but the wind was not as strong. To our surprise, we found that lightning had struck a palm tree only a few inches away from our house. It could have taken our lives mother said, but I reminded her that it could not have happened as I was chanting Jagannath’s name. I showed her the mayhem in the surrounding and told her we were better placed with only water pouring down from the roof. We were drenched, but still alive. Our house was damaged, but not grounded. That might have helped me to reaffirm my faith in Lord Jagannath. As my eyes turned to the other side of our house, I saw an uprooted banana tree. I hurried to get the bananas. I also wanted to cut the tree and get its soft inner trunk for mother to prepare some curry. It was a struggle between my hunger and the prospect of getting rid of it. Before I could decide what to do, my mother opened the front door. It was equally devastating. I could see hardly any roof on what were once houses. What also drew my attention were coconuts lying on the road. Some were still falling from the trees. Mother asked me to collect a few coconuts, but then all were not ours. In a struggle between what is right and pangs of hunger, the latter had won that day. With great reluctance, we thought of collecting the coconuts. Had it not been such a moment of despair, mother would not have allowed us to touch the coconuts. Motherly instinct to feed her children got the better of her ideals that day. She tried to convince me that how could anyone know which coconut came from which tree. The conflict between rectitude and reality was still within me, but I succumbed to the fact that without the coconuts we would go hungry for some more days. As I collected the coconuts, I kept chanting the Lord’s name to avoid being injured by a falling coconut. My mother was my strength and she reminded me that nothing would happen if god wanted to protect us. It were not coconuts alone, we collected bananas, papayas and even the leaves of the coconut trees that were used to cover the leaking roof. The leaves were also used as fuel. The exercise left me tired and I felt hungry again. Even in my hunger, I thought of the blessings of Jagannath on us. Since then my devotion to Lord Jagannath has grown manifold and I started feeling his presence whenever I am faced with a difficult situation. May be it was my faith or maybe it was his wish to take me where he wanted me to see me. Though I collected the raw materials, it was not possible for mother to cook as the oven was still under water. So, we drank coconut water and ate its tender pulp. Before starting to eat, I called my neighbours to take their share. It was also a way to get rid of my guilty feeling. Indeed the chanting of Jagannath made me sail through all odds. I have no hesitation to admit that ever since my mother introduced me to Lord Jagannath, I felt a new energy in me. I believe that I always enjoy the blessings of Lord Jagannath. Whatever I have been doing for my fellow human beings and my society, I believe Lord Jagannath has showed me the way and led me on that path. I strongly believe that he would continue to bless me to do more for the society as I have completely surrendered myself under his lotus feet.